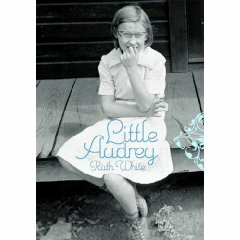 Little Audrey, is Ruth White’s latest novel and most personal work to date. It tells the story of a time in her childhood when she and her family were living in a coal mining camp in southwestern Virginia. Taking real events and imagining them through the eyes of her older sister, White crafts a poignant and charming tale of what it’s like to be poor, hungry, and sometimes happy.